After a bit of a hiatus I returned to my Made With Oakshott project to finish it off. It shrunk a bit in the wash: the quilt top finished to 64" across, and after laundering it's 60". I had aspirations to quilt a big spiral radiating outward from the star block in the centre, but once it was basted I balked at the prospect of wrestling the whole thing through my tiny Featherweight to start from the middle -- it feels almost as heavy as the machine! Instead I used a red-and-orange variegated Aurifil thread to quilt an allover diagonal grid, following the bias edges in the flying geese. The texture of the quilted grid de-emphasizes how the top was actually pieced, and creates a sort of trompe l'oeil effect where the flying geese read as half-square triangles. I used Soft'n'Toasty batting, a bit heavier than my usual favourite Quilter's Dream Request, which filled out beautifully after a run through the wash. The binding is pieced from 2.5"-wide strips cut from leftover Oakshott Rubies in no particular order. I attached it to the quilt from the front by machine, and tacked it down on the back by hand. The backing is the same Essex Linen as the background fabric on the quilt top except one corner that I pieced from 6" Oakshott squares for a little pop of colour in the field of grey. Thanks again to Lynne and Michael Oakshott for the opportunity to play with these beautiful fabrics! Just beautiful. 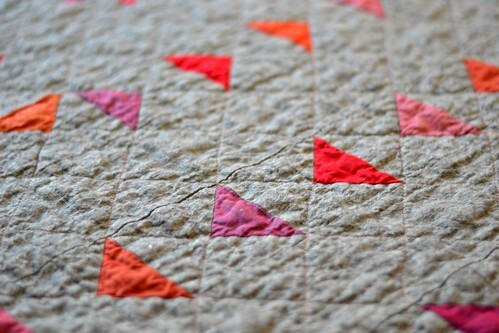 The colours are stunning against the natural background and the quilting gives it a gorgeous crinkly texture. Perfect. It's lovely and what Annabella said about the colours. What colour essex have you used? That's a fair bit of shrinkage on the Oakshott which is making me nervous as I am using it at the moment! Your quilt is very pretty. 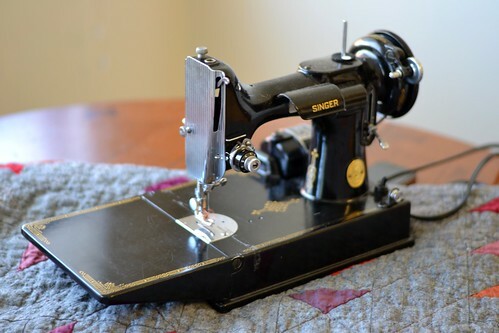 Did you use the Featherweight to machine quilt it? 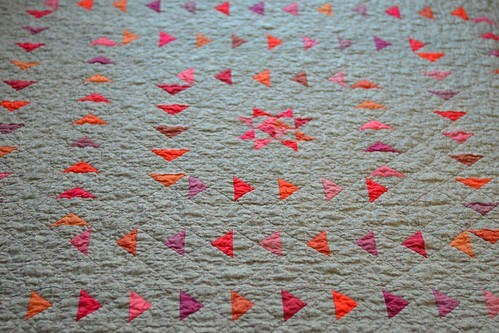 Love the lines of this quilt ~ it's really lovely! very nice quilt, that is quite a shrinkage, I always wash my fabrics when I buy them, started so have to carry on now. Love the colours and textures of this quilt. Beautiful! This quilt is amazing, I love it! And no I wasn't paid to say that. Oh wow! I love this!! 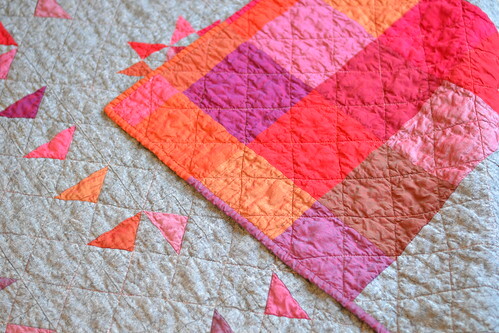 The colors and the geese, the quilting - oh my!